Blog from Don Det, Laos | Eagles and Rachel on tour! We arrived in Laos having made our way across the Mekong River. After an hour or so to get through customs we had our first experience of Laos. During our first day in Laos we visited a local village which reminded me of a shanty town. All the houses we build out of wood and were all on stilts. All of the families that live here are completely self sufficient; they grow their own rice, have chickens, pigs etc in their garden and have a local river to wash themselves/ their clothes. It was quite an eye opening experience and was completely different to the culture we're sued to. After our enlightening trip to the rural village, we spent the evening sampling the local cuisine at the night market and then somehow managed to find a pub showing the Man Utd V Man City game! The next day we went to a remote village overlooking the Mekong River. Rachel and I had out own bungalow overlooking the river with a hammock outside. The views were amazing; the small town we were staying in was surrounded by mountains and it made for a really peaceful setting. The evening was spent taking on the locals at Petanque and then going to a local "disco". The disco consisted of a few Laos teenagers dancing around a room with a TV on that had a music channel playing! Not really what we'd call a disco but after getting through a load of Beer Lao, we all had a good time. We'd been with the same group of people for almost a week now and we were all getting on really well. Once again, we were up early the next day as we had a 4hr boat journey to our next destination, Luang Prabang. We were floating down the river on long, barge style boat and the views were impressive. Luang is a really picturesque town which is famous for its street markets. We spent the evening strolling around the market which gave me the opportunity to practice my haggling skills! Our next port of call was a town called Vang Vieng. Vang Vieng is the party capital of Laos and it known for its Tubing. Tubing is where you hire a rubber ring and float down the river. Sounds quite tranquil and relaxing right? Wrong. There are loads of pubs and bars lined down the river and the idea is to get as drunk as possible! There are loads of rope swings and places to jump in but as we were in the dry season, jumping from a height would have caused certain death and/or loss of limbs. Therefore we decided to go easy on the extreme sports and focus more on the extreme drinking! That evening we all went out and had probably the biggest night out in Laos. There was a really good atmosphere in the group and everyone seemed to have a really good time. This was the night where I was assigned my new nickname which has stuck for the rest of the tour, Bucket man. There are loads of drinks offers in Vang Vieng which mainly involve Buckets. They basically fill a bucket up with half a bottle of spirit of choice (my tipple was whiskey) and then add ice and a dash of coke! We all got through a fair few buckets however it seemed as though yours truly consumed the most, hence the nickname. Little did they know that I spent the rest of the night devouring the contents of my stomach into our toilet. Nice. There were a few sore heads the next day as we made our way to the capital, Ventienne. Not a lot happened here so I won't bore you with the details. The following day was spent at an exotic waterfall where we'd spend the night camping in the jungle. We had to go into the woods to chop down some fire wood and then cook our dinner on it! It was such a unique experience; I felt like I was in Lost. True to form, I spent the night sleeping with a machete, incase any of the Tigers in the jungle decided to say hello. Ha-ha... I felt like John Locke. The next day was also really interesting as we had dinner at a local's house. The food itself was forgettable but the experience was anything but. All of the locals made us wrist bands and made us all feel very welcome... even letting us sample some of their home brewed alcohol. Very kind of them but the alcohol tasted like feet. Over the next few days we stopped at various locations, all of them had stunning views and many of them had lush waterfalls to swim in. It was one waterfall location that provided an entertaining moment... there I was laying in bed one night, waiting for Rachel to finish up in the bathroom when all of a sudden I heard an almighty scream from the bathroom, closely followed by Rachel sprinting into the jump room jumping up and down screaming her head off. What's wrong I asked? And all I could make out from her response was 'spider'. I entered the bathroom expecting to find daddy long-legs sized spid, but the eight legged freak that greeted me even made me let out a loud shriek. It was huge; I'm not exaggerating when I say it was the size of my hand. It was moved around so quickly as well. I eventually caught it by trapping it under the bucket... Bucket man by name, Bucket man by nature. I quickly placed a bottle of water on top of said bucket and left it there until we checked out. I feel sorry for the poor girl who had to clean the room the next day!! Our final destination in Laos was a town called Don Det. As it was our last night we all went out and got smashed... consuming a number of buckets (what else?!) along the way. Jeremy our tour leader, had seriously been drunk every night on the tour. I wasn't sure what to make of him at first but by the end of the tour you couldn't help but love him. The next day we caught the sleeper train and made our way back to Bangkok. 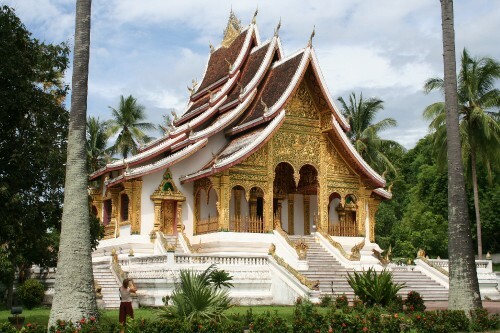 On reflection, Laos is a beautiful country with some cool towns thrown in... However by the end I was looking forward to some proper western food and comfortable beds!